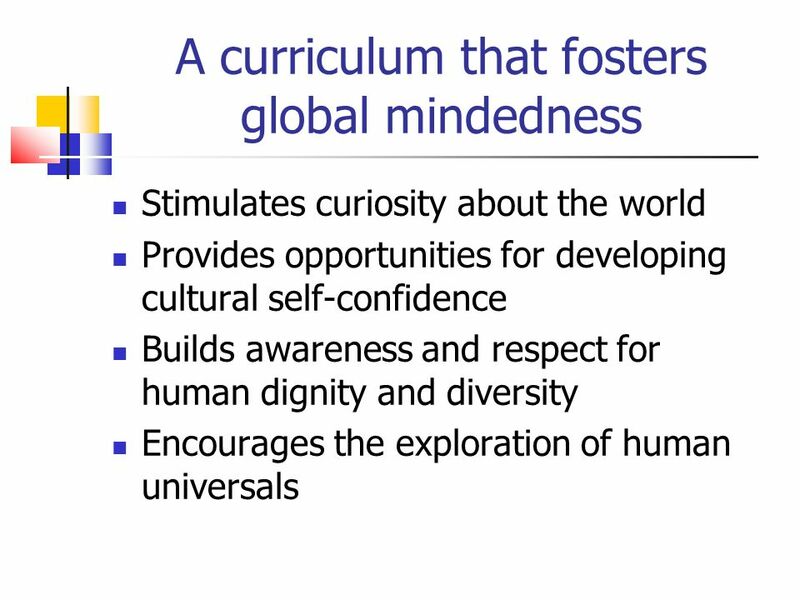 CULTIVATING HUMANITY IN SCHOOLS Promoting global mindedness as good teaching practice. 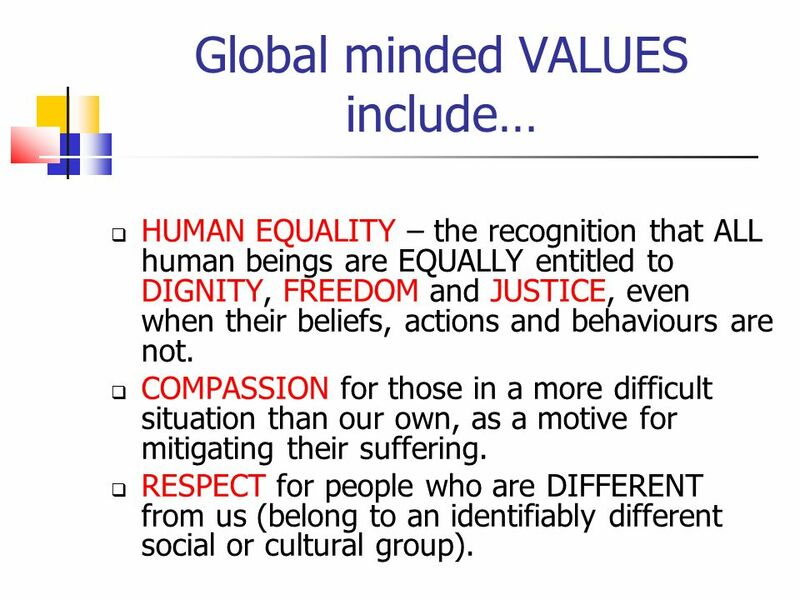 3 How can we recognize global mindedness? 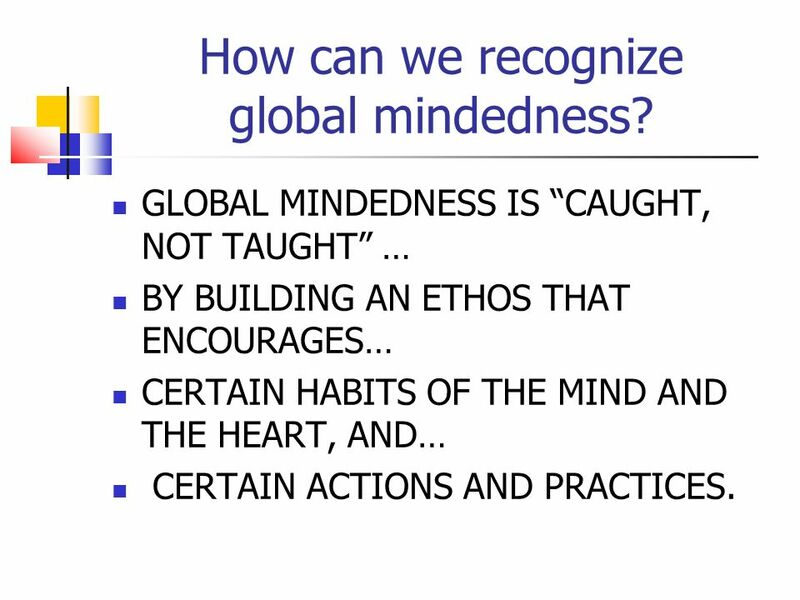 GLOBAL MINDEDNESS IS CAUGHT, NOT TAUGHT … BY BUILDING AN ETHOS THAT ENCOURAGES… CERTAIN HABITS OF THE MIND AND THE HEART, AND… CERTAIN ACTIONS AND PRACTICES. 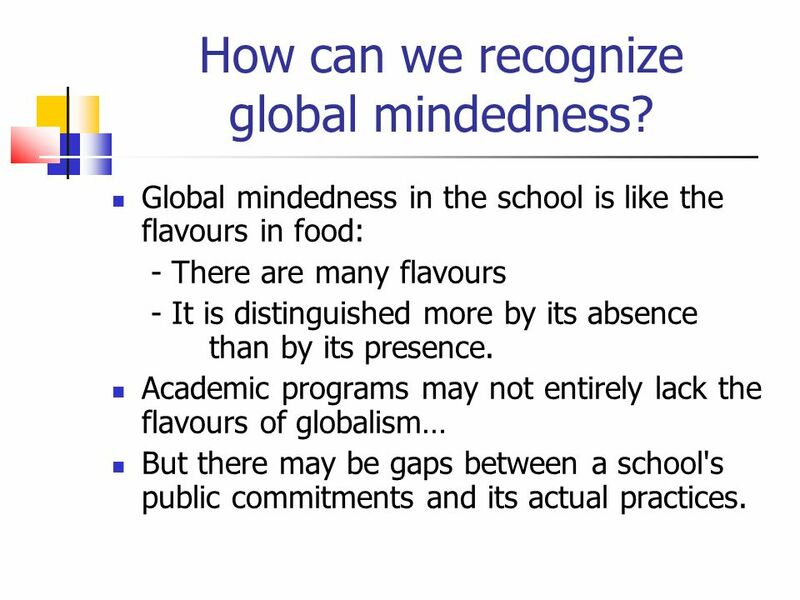 4 Global mindedness in the school is like the flavours in food: - There are many flavours - It is distinguished more by its absence than by its presence. 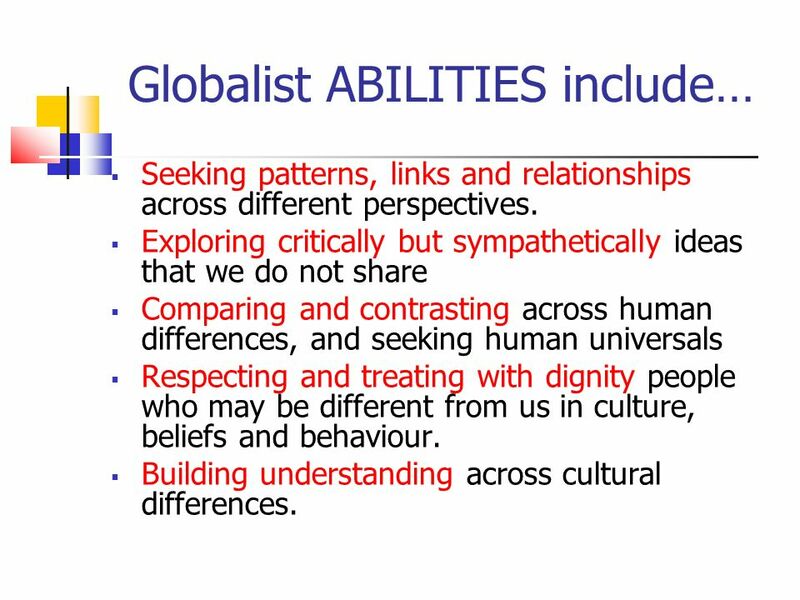 Academic programs may not entirely lack the flavours of globalism… But there may be gaps between a school's public commitments and its actual practices. 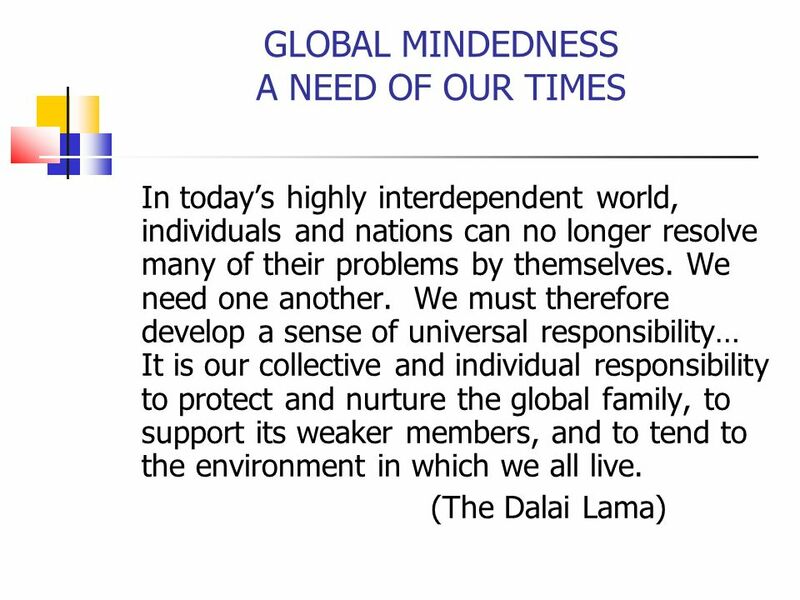 How can we recognize global mindedness? 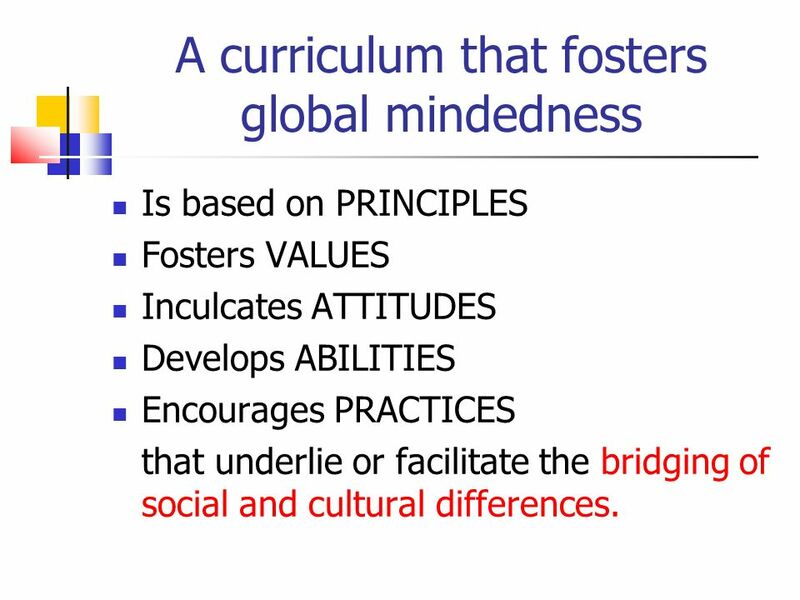 5 A curriculum that fosters global mindedness Is based on PRINCIPLES Fosters VALUES Inculcates ATTITUDES Develops ABILITIES Encourages PRACTICES that underlie or facilitate the bridging of social and cultural differences. 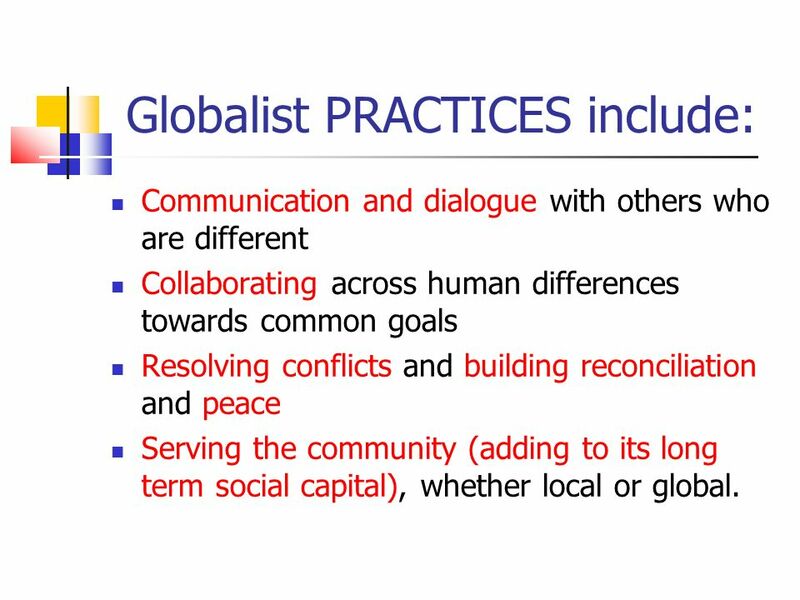 11 Globalist PRACTICES include: Communication and dialogue with others who are different Collaborating across human differences towards common goals Resolving conflicts and building reconciliation and peace Serving the community (adding to its long term social capital), whether local or global. 19 This process is about planting seeds as in authentic educationand there is no way of knowing when, where or how those seeds will flower. 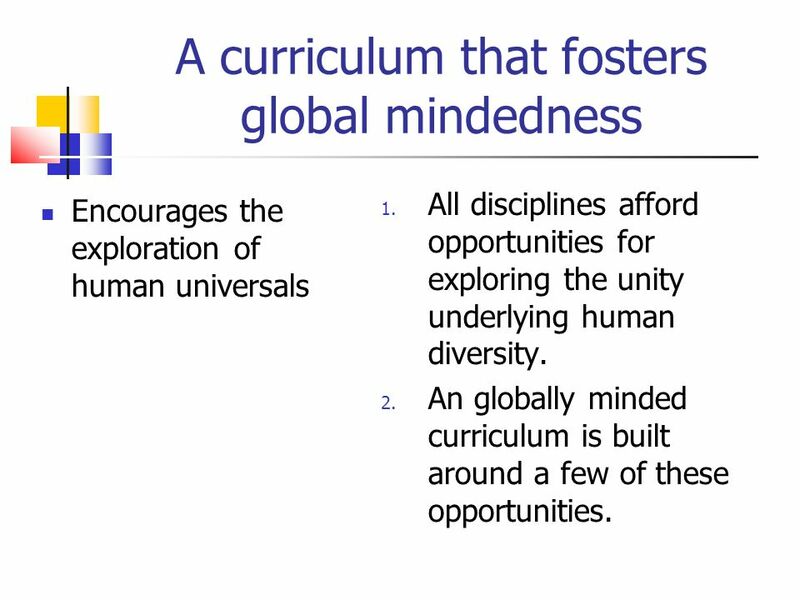 Palmer, Parker The Courage to Teach: Exploring the Inner Landscape of a Teachers Life 1998 What kind of teaching fosters global mindedness? 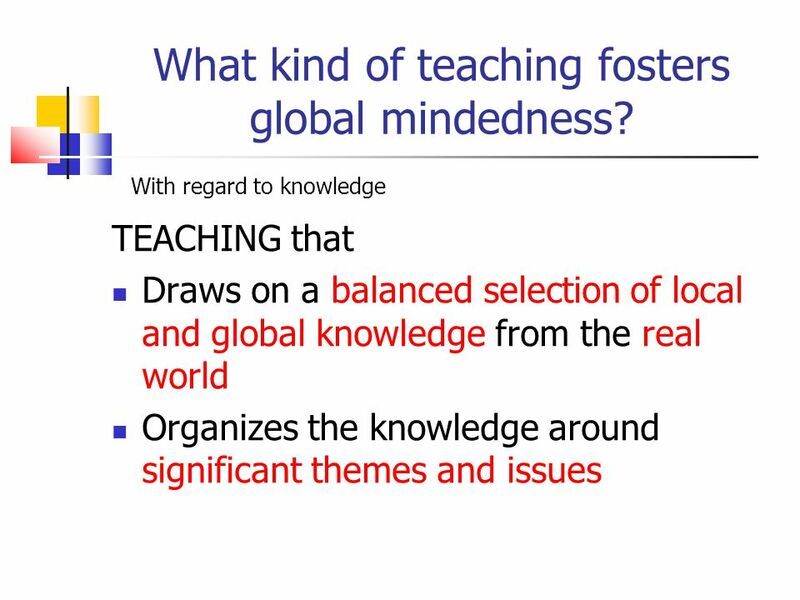 22 TEACHING that Draws on a balanced selection of local and global knowledge from the real world Organizes the knowledge around significant themes and issues With regard to knowledge What kind of teaching fosters global mindedness? 23 TEACHING that helps students to Choose appropriate concepts, metaphors and theories to BUILD understanding APPLY and TEST understanding on a real problem CORRECT and IMPROVE ON current understanding through reflective evaluation of the results of testing FLEXIBLY apply RELEVANT knowledge and skills to make sense of new situations. DEMONSTRATE the understanding through performances and artifacts. 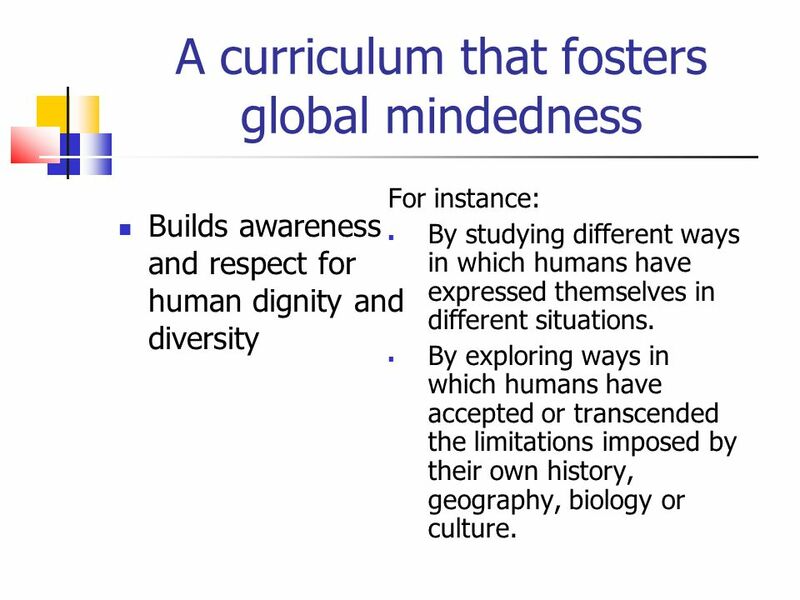 With regard to concepts and understanding What kind of teaching fosters global mindedness? 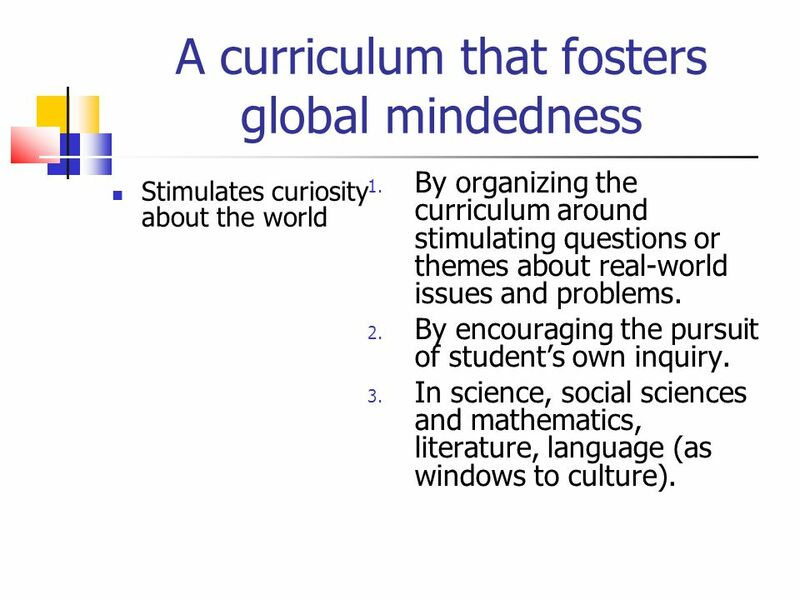 24 Teaching that creates a range of activities allowing learners scope for individual as well as collaborative inquiry that allows some scope for inquiry that is trans-disciplinary, to enable students to experience concurrency of learning and the different perspectives of each discipline. 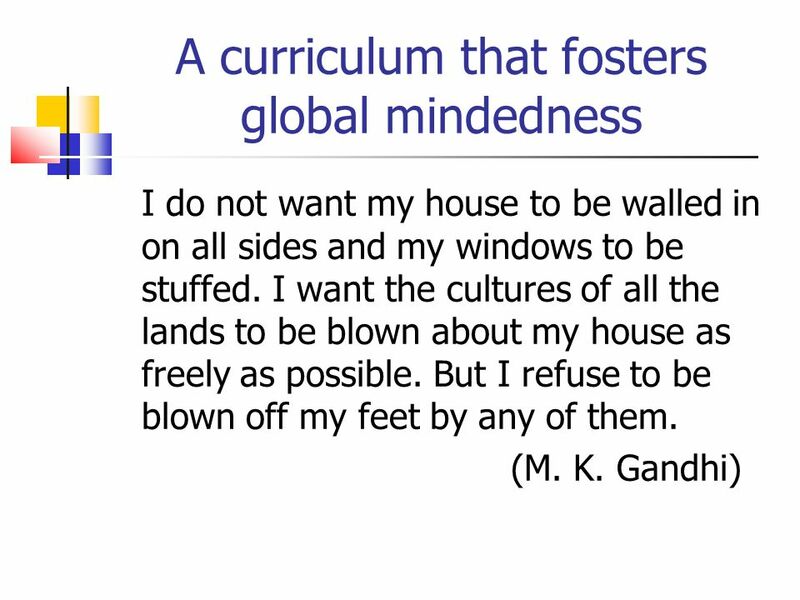 What kind of teaching fosters global mindedness? 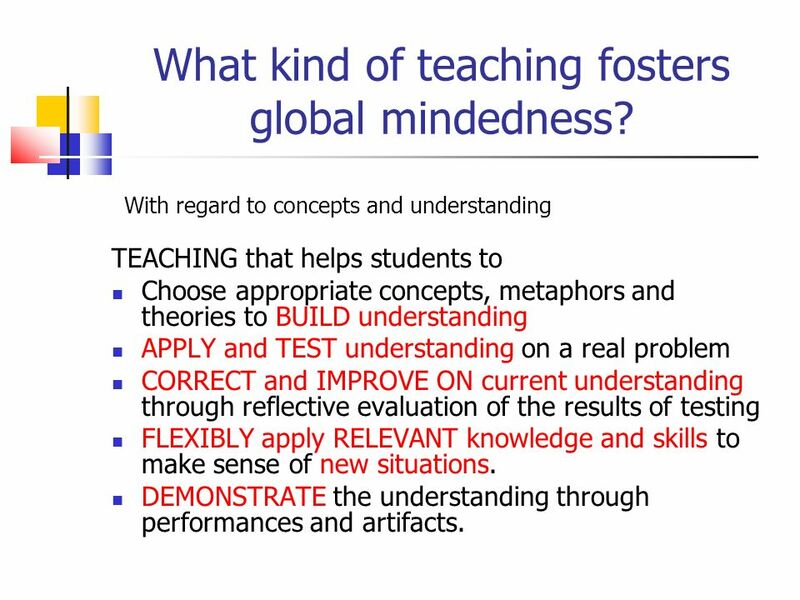 25 Teaching that provides opportunities for reflection on the learning process To evaluate ones learning To discuss ones learning with other learners To collaborate in build learning communities within the school What kind of teaching fosters global mindedness? 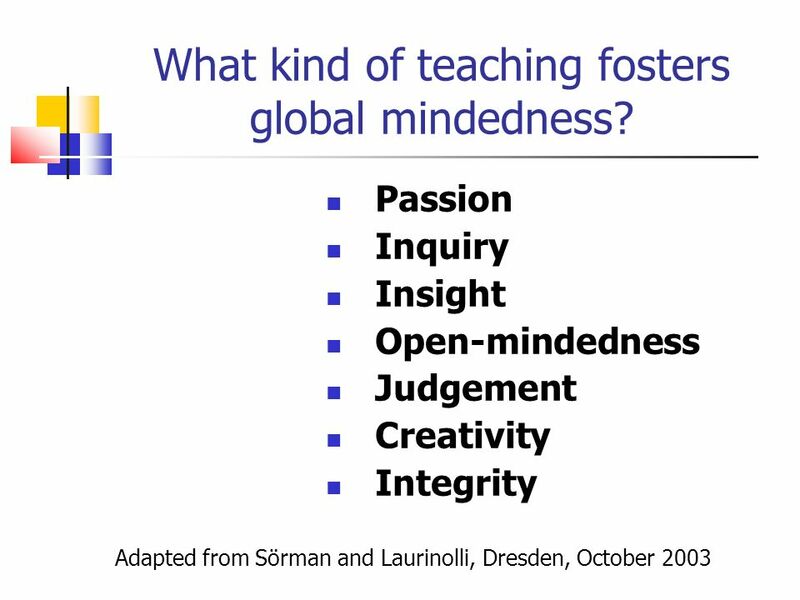 26 Passion Inquiry Insight Open-mindedness Judgement Creativity Integrity Adapted from Sörman and Laurinolli, Dresden, October 2003 What kind of teaching fosters global mindedness? 27 The teacher is not a machine for giving lectures, but is a resource to the students - one who inspires them to investigate and question, one who guides them and one who is able to sustain their enthusiasm for study and research. The real teacher is himself a life-long student." 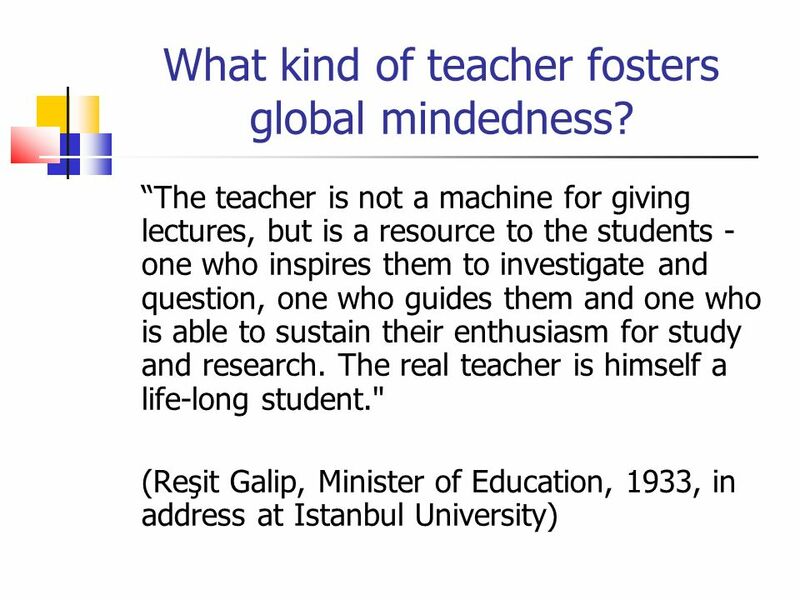 (Reşit Galip, Minister of Education, 1933, in address at Istanbul University) What kind of teacher fosters global mindedness? 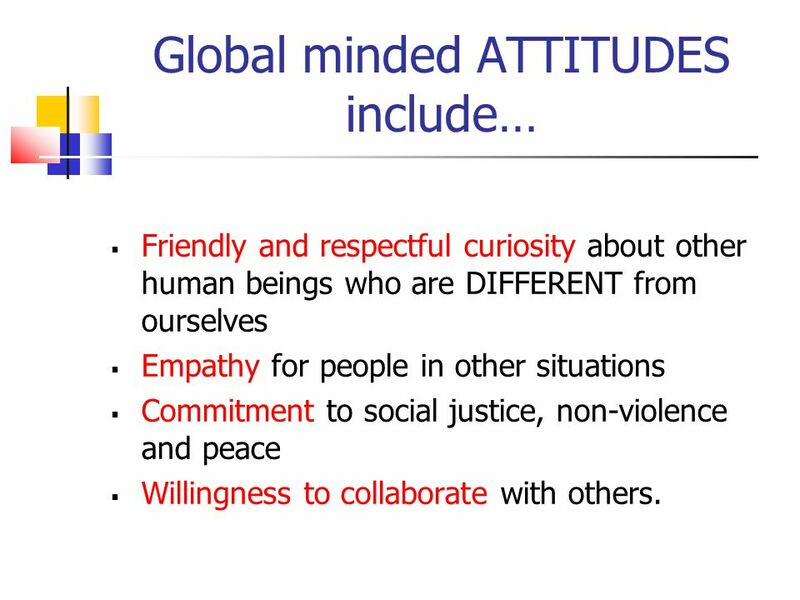 Download ppt "CULTIVATING HUMANITY IN SCHOOLS Promoting global mindedness as good teaching practice." Education and the Global Citizen Prem K Kalra, Department of Electrical Engineering, Indian Institute of Technology, Kanpur. IB- PYP Presentation September 11, 2014. 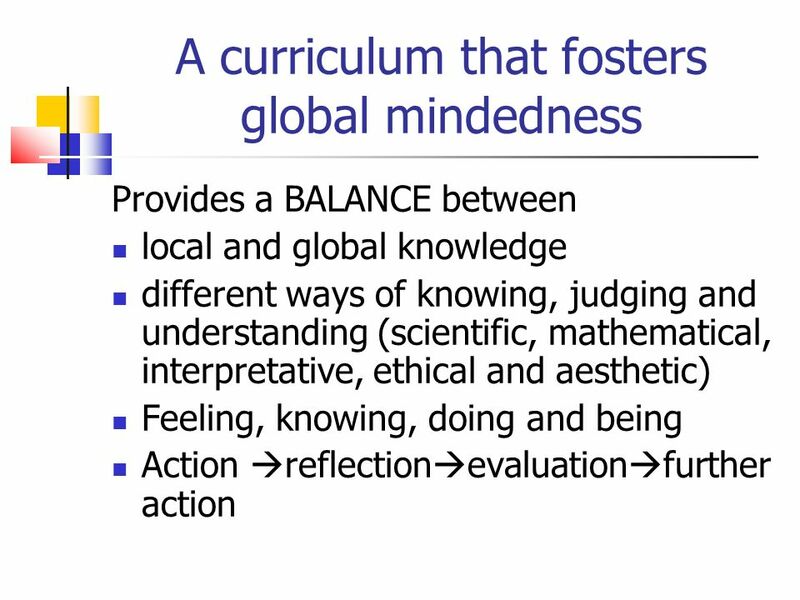 Introduction to International Baccalaureate Primary Years Programme(PYP) Objective: Gain an understanding of the basic philosophy and curricular model. Adult learning principles Planning a successful workshop. Educational Platform Cheryl Urbanovsky. I believe education is a calling. As educators, we are called to walk with our children as they begin their journey.